Play with snow no matter what climate you are in? Have a Winter Wonderland inside where it’s warm? 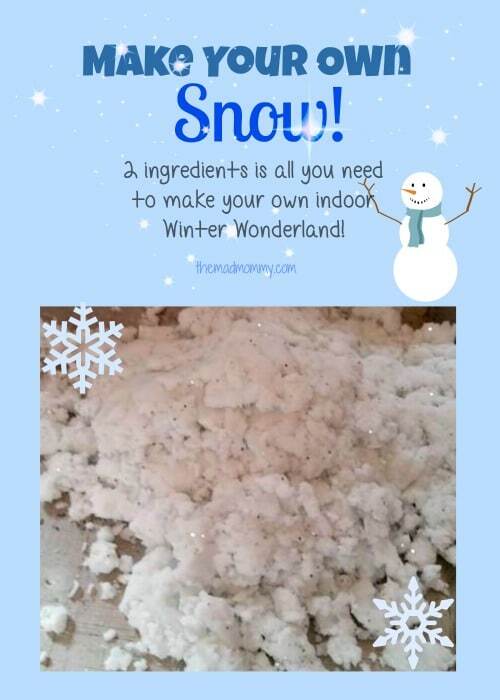 Did you know you can make your own snow? We Made Our Own Snow! It couldn’t be easier to bring winter indoors or to bring a little snowy fun to those warmer climates! You Can Make Your Own Snow! Two ingredients are all you need. Hair conditioner and baking soda, both of which are super inexpensive! You could also use other things to add to snowy, sensory adventure. Things like sequins, peppercorns (to mimic coal), essential oils (wintergreen or peppermint could be fun) and anything else your imagination can come up with! Simply mix 1 and a half cups of baking soda together with 1/4 cup of hair conditioner. Then it is all about feel. If you want it moister, add more conditioner. If you want it more fluffy, add more baking soda. Now, go ahead and play! This a fantastic sensory activity and can also be used as a wonderful science experiment! Making your own #snow is as easy as 1, 2, 3 and you’ve got a great #activity! It is even cold to the touch! It is such a simple activity, but they will play with it for hours! Echo this is perfect! We don’t have snow so I’m sure they will love this since they have been curious about from the movies we’ve seen! Yay! This will be so much fun for you guys, Jhanis! It is super easy to make too! Hahaha, I know how you feel! We made this so I didn’t have to go out in the freezing cold every 5 minutes! Kids can play in snow while I’m inside toasty warm? Yes, please! lol! Great idea! It is seriously so much fun and way simpler than bundling them up over and over again! This is super fun!! We are currently waiting for it to snow so we can build a snowman! Hehehehe! You can do this one while you wait! What a fun idea and so easy, items we already have in the house! Can’t wait to try this, my kids will love it! It really doesn’t get much simpler and my kids played with it all day! Yeah, I definitely want a snowman!! Like Jhanis said, this is perfect because we never have snow here in the country! This is be so much fun for you and Reiko! Ooh, this is just brilliant, thank you! Thanks Alison! I hope you give it a try, if you have a moment! I know how busy you are right now! I have to try this. I wonder why hair conditioner? That is such an odd ingredient. I guess it would have to be some cheap-o hair conditioner. I’m going to totally try this. Thanks so much for sharing, Echo! I’m not exactly sure yet what causes the reaction. I am going to look into it though. For Science! I have never made the cloud dough. This is super easy and not very messy! Oh we’re definitely going to have to give this a try! We haven’t seen snow in years! It is so much fun, Amber! My kids loved the cold sensation too! Thank you for sharing this on Meandering Monday! We have snow but its not sticking and my little ones have been begging to play in snow. This should satisfy them. They will have so much fun with this! I pinned this yesterday before I even got a chance to comment. It’s brilliant! Scarlet is totally into it. YAY! It is really a great activity and easy to set up! Whaaaat?! I am totally trying this! Love it! I hope your kids love it as much as mine! This looks so FUN! Thanks! It really is awesome! For all ages! Oh my gosh! SO much fun! I am going to make tons and tons and tons. Ok maybe not that much. But wheeeee! Thanks for linking up to Snickerdoodle Sunday! It really is a blast to make and play with! This is really cute. I think I’m going to try this with JR. I think he’s going to make a complete mess, but isn’t that the point? Hahaha! It is not as messy as you think, but yes, messy fun is the best fun! How fun and so simple! My kids will love making a snowman with this. It only snows near me every 10-15 years. MY kids adore it. I love it for when it is too cold outside! This is the kind of snow I could probably handle! It is super fun and easy! I love this. We are going to try it! Thanks for sharing with #SmallVictoriesSunday #linkup! Hope you join us again this weekend. I hope your kids enjoy it as much as mine did! IT will be so much fun for them to play with! Thank you for sharing and you know I will be there! I love this! I live in Florida and it’s only snowed one time that I can ever remember and that was back in ’89! My kids are always begging to take a trip up North so they can play in the snow. Now we don’t have too! I can just make this for them:) FYI, I’m featuring this at this week’s Teach Me Tuesday Linky Party! Thank you so much for featuring me! I was and am so honored! This looks so fun to play with!!! Thanks for sharing at the Love to Learn Linky. I will be featuring your post this week. Thank you so much! I am so excited that you enjoyed it so much that you are featuring it! Of course! I love the linky! I LOVE easy and this really is easy! Can’t wait to make some fake snow!! It is so super simple and fun! I’m on vacation in southern Cali and sitting on my daughters sofa…I broke my foot walking down steps. I’ll be leaving for our home in IL in two days. When I get back I’ll be having surgery and I’m sure the going outdoors will be verrrrrrryyyy limited. My hubby and I keep our 2 year old grandbaby and this will be perfect to allow her to have fun and I can still keep my feet on solid ground. I can’t wait to do this with her. She’ll love it. Thanks for sharing. Hi, How long does it last? We’ve played with it for hours. It will last until it dries out. I’m having a birthday party dec 8th how soon can I make this ? How long does it keep for to play with?